* 1 queen bedroom * 2 double bedrooms * 1 bedroom with twin single beds Linen and towels are provided ready for your arrival. All bedrooms have ceiling fans. Guest contribution: "I just wanted to let you know how much we enjoyed our time at Valley View Cottage. You indeed have million dollar views, especially from the top of the had time to drive around the area, and in my opinion you have one of the best locations and situations in all of the hunter valley. Actually, that was the consensus of the entire group and they insisted that I write you to thank you and express their pleasure with the property". We have successfully been in business for 16 years. We aim for you to be comfortable while enjoying an Australian country experience - that feeling of 'getting away'. You can see more photos on our flickr page and instagram and talk with us. Located within minutes of wineries, restaurants, cafes, golf, ballooning etc Valley View Cottage is close to the heart of the Wine Country action while offering 5 private and peaceful acres of park like grounds and gardens, only for your enjoyment. Tour the vineyards, play golf, ride a horse, hire a bike, have a picnic or enjoy a scenic lookout. 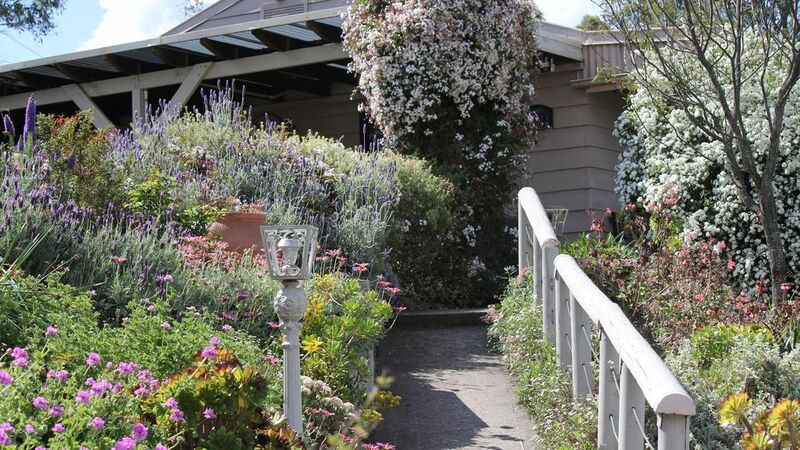 Valley View Cottage is in the vineyard district, and offers a base for many day trips to enjoy the delights of Barrington Tops, Port Stephens and surrounding National Parks. Few properties offer such solitude, peace and scenery, and facilities. A country escape like this is becoming harder to find. Our own rates are - Weekends are 2 night stays for $1400 for up to 8 guests. Midweek monday/thursday inclusive - a minimum of $250 per night for 2 guests [1 room] $75 for additional guests [2 night minimums]. Long Weekends are a 3 night minimum, Easter 4 night minimum. Specials can apply for short notice stays: watch our site. Valley View is pet friendly. Why pay expensive kennel fees - when your dog can enjoy a holiday too. A pet fee of $25 applies per pet per stay. Pets must be booked in with us. Valley View has farm fencing with the neighbouring properties - your pet will need to be supervised, but has private acres to enjoy in your company. Bring your own pet bedding. No pet is to be left unaccompanied in the house at any time. Experienced holiday property owners of 16 years standing in the Hunter Valley Region of both Wine Country Valley View Cottage and Port Stephens Salamander Cottage, with lots of information and additional photos on our web sites, flickr, fb, instagram so you can easily connect with us and see what we are doing. Keen on gardening, natural environment and wildlife. We welcome hearing of your interest to stay. However any enquiry made via Home Away/Stayz we will direct you back to book on this listing. Valley View Cottage is a member of the Hunter Valley Visitor information Centre and Around Hermitage Association, and you will find us listed with them. Extensive Lower Hunter Valley views from this property, and of the Brokenback Range, especially from the hill top grounds not far from the house. Beautiful house, so peacefully situated - a wonderful weekend. Thanks! Gorgeous cottage in a great location. The cottage was so picturesque and very comfortable. Location was perfect - easy drive to everywhere we wanted to go in the Hunter Valley. Well, equiped kitchen, great location, spectacular views and a bonus that we could take our pup with us! The cottage is an excellent place to stay for a number of reasons. It is very well set up for a large family or group of friends with 2 wonderful outdoor dining areas. The kitchen is easily the best equipped of any we have tried over the last 10 years with no shortage of utensils. We have often been to places with kitchens that have 2 plates/bowls, a beaten up saucepan and the odd blunt knife and the owners think that is OK. The grounds are fantastic and our whippet and Italian greyhound loved charging around the lawns. The internal flooring is slate, which is ideal for a pet friendly place but it wasn't too dark inside due to sufficient windows keeping it light enough. There are coded locks on the front gate and front door, which eliminates the hassle of having multiple keys and adds to the secure feeling on rural property. Lots of wineries and cellar doors, cafes and restaurants in the Hunter Valley. Also scenic drives, hot air ballooning, music festivals, film and art events. Many wedding and celebration venues. Outstanding bird watching as Hunter Valley is an 'area of significance' for birds. Some convict and settler history and aboriginal art exists. National Parks and State Forests, some with lookouts.